A typical Paleo diet consists mainly of fish, grass-fed pasture raised meats, vegetables, fruit, root vegetables, and nuts. The paleo diet excludes grains, legumes, dairy products, refined sugar, and processed oils. Here’s a helpful flow chart. I have no idea where to credit this image (it’s all over the internet). If you know who made it… let me know and I’ll happily link them. But it is really amazing none the less. Now, what’s different about Paleo for Powerlifters and Olympic Weightlifters? In a nut shell, I focus my paleo plan of attack specifically on fueling my lifts, making my numbers go up, and getting as strong as possible. I work toward optimizing protein and carb intake to help reach my goals. Typically, the goals of a powerlifters and weightlifters are focused more around muscle growth than fat loss, so I place a strong emphasis on adequate protein intake and a higher percentage of carbs through out the day. I do not restrict protein powder, potatoes and the occasional small amount of white rice, chickpeas, & dairy. In the context of powerlifting and weightlifting, eating paleo will allow you to fuel your lifts and grow your body in the healthiest way possible. It will help you stay lean, well recovered, and ready for tomorrow’s lifting session. But you need to make sure you are getting enough protein and carbs. The number of calories to eat in a day will vary from person to person. As a general rule of thumb, big people need to eat more calories than small people, men need to eat more calories than women, and weightlifters need to eat WAY MORE CALORIES than non-weightlifters (so don’t compare yourself to your lame non-lifting friends). If you want to get really nerdy about things, you can calculate your specific caloric needs on a website like myfitnesspal or sparkpeople. 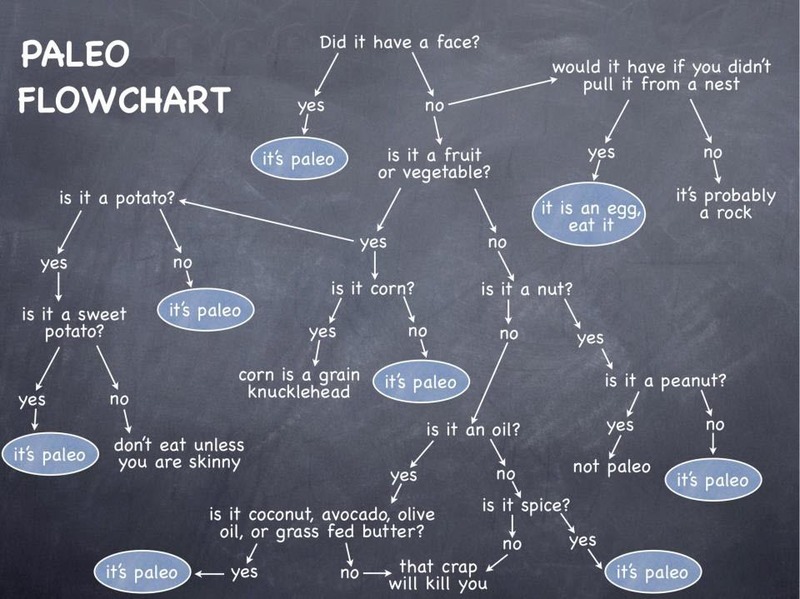 But really, if you’re eating paleo, you just need to listen to what your body and your lifting log are telling you. If you’re hungry, EAT. If you’re lifts aren’t budging, EAT. If you’re thin and scrawny and new to lifting, eat, eat, eat! And then, if after all that eating, you’re putting on more fat than you want along with your muscle, consider eating a bit less (or maybe just fewer carbs). Generally, If you want to make gains in the gym you need to eat food. SO EAT! Make sure the meals nearest your workouts are the biggest and include most of the day’s carbohydrates. This is what it’s all about. You need, need, NEED to eat a good, clean complete protein source with every meal. This means meat, seafood, or protein powder. Don’t trick yourself into thinking that a handful of nuts is going to do the job. It won’t. Nuts, cheeses, and beans often get described as protein sources, but they don’t have a high enough protein content to count when it comes to weightlifting. Those foods fall more so into the “Fats & Carbs” category. You need REAL PROTEIN with every meal. Women should be eating a minimum of about 1 gram of protein for every pound of bodyweight, and men should be at about 1.5 grams for every pound of bodyweight. That means if you are a 200 pound dude, you should be eating about 300 grams of protein a day. That breaks down to about 3 protein shakes (150g), 8 oz of chicken breast (50g), 6 oz of ground beef (50g), AND 4 eggs (25g). That’s a lot of meat! This is why you need to make sure you have it included in every meal. Check out the SBWC Protein Calculator to figure out how much you should be getting. Every time you sit down to a meal ask yourself, “Where’s my protein?” Then once you find it, ask yourself, “Do I have enough?” It should be a substantial portion of the food on your plate and, at the VERY LEAST, the size of your hand. If you are staring at a bowl of pasta with butter on it… you need to get more serious about your food. Your muscles will not grow on a diet without protein. As power lifters and weightlifters, we need carbs to keep our muscles growing and to continue to see progress under the barbell. The quantity of carbs you should consume throughout the day is debated, but it is inarguable that you NEED carbohydrates in your pre/post lifting meals if you want to make gains and grow muscle mass. Don’t stress too much about the amount of carbohydrates you’re eating in the day overall. It’s more important to focus on the type of carbs you’re eating and the time of day you’re eating them. “Active Carbs” such as potatoes, sweet potatoes, carrots, fruit, and root vegetables should be eaten primarily during your pre/post lifting meals and in the morning. These are the carbs you should try to “earn”. Work hard for them so your body can put them to good use. When consumed, active carbs cause an insulin spike in your body. This insulin spike will tell your body to grow (either as muscle or fat). Eating active carbs with your lifts will encourage your body to use it for muscle growth. In general, if you are trying to gain weight, eat more Active Carbs during the day, and if you’re trying to lean out eat less Active Carbs during the day. But don’t sacrifice them during your Pre/Post workout meals. “Free Carbs”, like vegetables and greens, can (and should) be eaten all day long. Free Carbs are high in fiber, vitamins, and minerals which will help with your recovery dramatically. “Refined Carbs”, like grains, legumes, sugar, and pasta… aren’t typically encouraged as part of a paleo diet but every once in a while… go for it if you feel like your recovery needs the extra calories. Fat (good fat!) is not bad for you. It will not ‘make you fat’, and it should be respected as a valuable tool in your recovery toolbox. Healthy Omega 3-filled fats will keep your muscles feeling fresh and your joints moving freely. Additionally, they will keep your brain sharp and your food satisfying! Just as with carbohydrates, you’ll want to gear yourself toward fats that have gone through the least amount of processing possible – this means fats that come from animals (fish oil, lard, and butter) & fats that are as close to their vegetable sources as possible (such as olive oil, avocado oil, and coconut oil). Additionally, fresh avocados and nuts are a good source of healthy fats. Calorically, fats can be thought of as a way to fill the gaps between your protein and carbs. If you are eating more carbs at your meal, you’ll eat less fat. And vice versa. Generally, don’t stress about these things too much. Just make sure you’re filling up on protein and eating the rest of your calories as high quality as possible.